Editors Note: This is an out of date review. 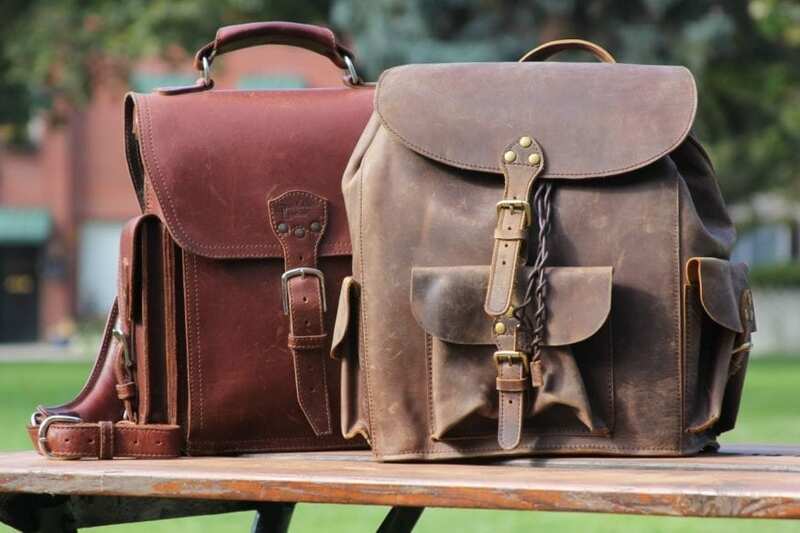 The latest Marlondo Leather Backpack compares quite favorably against the SBL backpack. I impressed it upon TJ that I retain the full copyright for this piece and TJ is permitted to use it so long as he publishes it in full. He is a good friend to me, and an excellent human being, in my judgment–and he let me borrow the backpack for the review. I insist on full disclosure, and not all of what I am about to say is positive. I would rather write something and have it never see the light of day than to have it shred to pieces by an editor as if it were the American constitution and he were an American president in the late 20th or early 21st century. 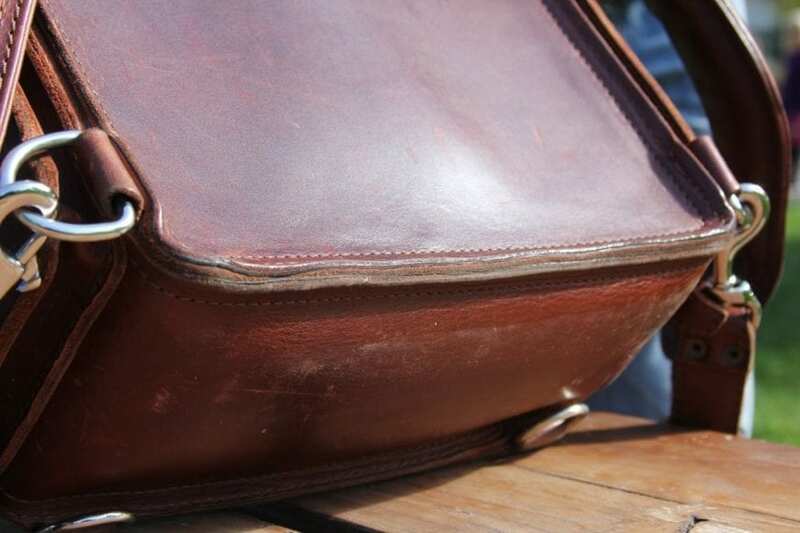 I own an older Saddleback Leather Backpack in chestnut. I am the guy in this review. The data reflects a strong correlation between owning the Tank and liking it. Therefore, due to my background, my interest in reviewing the Marlondo Backpack as objectively as possible conflicts with my unavoidable confirmation bias. And, in the spirit of full disclosure, at the risk of adding unnecessary details, I should also tell you that I own an SBL chestnut iPad case and a chestnut portfolio. I’m sure I’ll be smeared as an overly loyal SBL fanboy by that one obnoxious dude in the Facebook forum. I forget his name. But at least now you can’t accuse me of hiding it. So go pound sand, obnoxious guy whose name I can’t remember and prefer not to look up (for obvious reasons). The good news is that I am in a good position to evaluate the strengths and weaknesses of the Marlondo piece in light of extensive use of a rival bag. And in fact, rather than attempting an uninterested, context-insensitive review of the Marlondo bag, I think I’ll take the liberty to review this backpack as it relates to my specific use cases. For those who can’t relate, tough. There will be someone out there who finds that this review provides the exact insight he or she needs, right when he or she is at the decision- making stage of the sales funnel. And you, my good sir or madam, are welcome. Should you buy this bag? 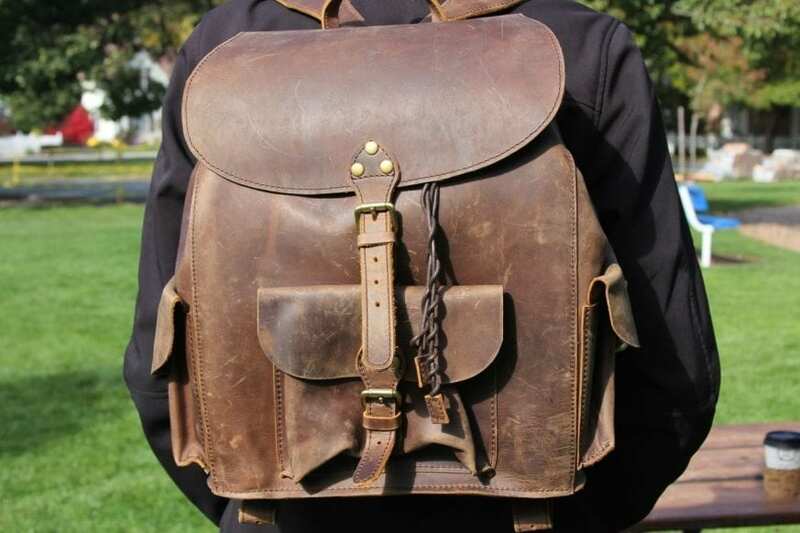 It is my assessment that this leather backpack represents a remarkable value given its retail price. 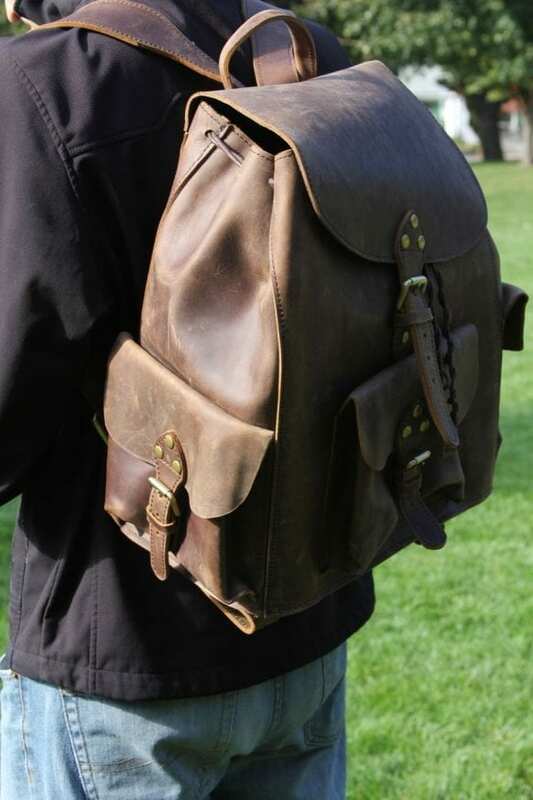 Whether it is the most beneficial leather backpack option for you, given what it costs you personally, is contingent on data and subjective qualitative states that I neither have access to, nor any interest in attempting to evaluate. What could you use this bag for? This bag is good for going to the gym, going to the beach, traveling (casual affairs only; and it should be ok as a carry-on), toting your study materials and gym clothes around campus, and day hikes. In terms of utility, it is 1. lighter, 2. more flexible, and 3. has a greater capacity than the classic SBL backpack (I understand Best Leather has a forthcoming review of the newer SBL Square Backpack, so stay tuned for a comparison there). Let’s get one thing on the table. Leather is beautiful. It smells good. It is durable. When I saw this piece, it was a delight. 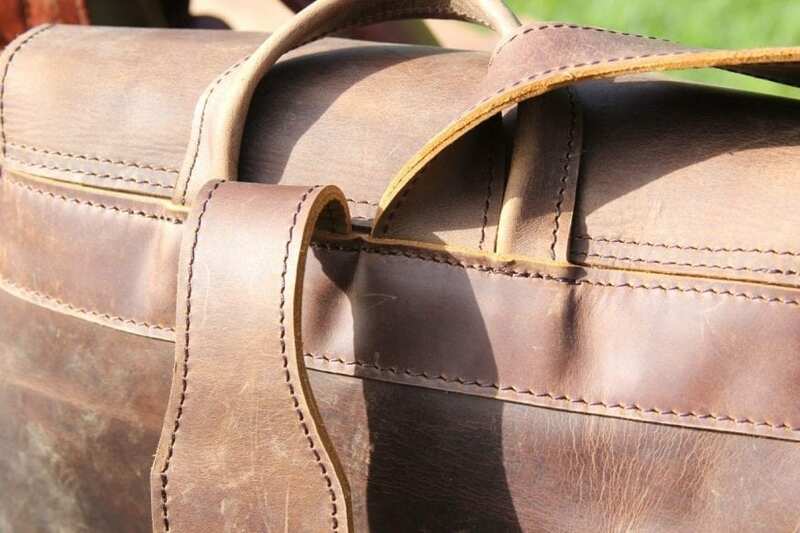 The point is that this is a good bag and it is made of leather. It is 1. beautiful, 2. fragrant, and 3. durable. I would rather own it than not own it. It bears some finite, nonzero quantity of value. What’s more is that the Marlondo backpack is unique. 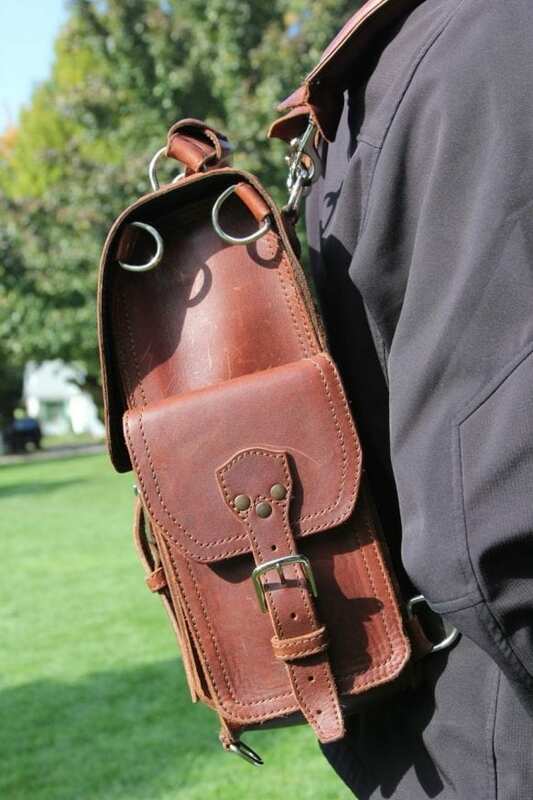 The Saddleback backpack is unique too, but that’s a red herring. 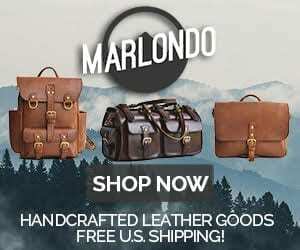 So given that 1. leather is good and 2. the Marlondo leather backpack is unique; therefore the Marlondo leather backpack gives off an eerily deceptive allure. I will proceed to rip this thing to shreds and say that the SBL backpack is far superior (it is), but there is a part of me that already misses this bag. There are aspects of it that are uniquely attractive, even if, net of everything, I still prefer my current bag. It is a strange disposition to articulate, but there it is. • I do like the appearance of this bag. I like the overall visual impression it gives, and I really like the profile of the bag when worn. My model of SBL backpack has a well-known tendency to dig into the lower back and lean away from the shoulders of the wearer. The leather on this thing has a remarkable matte texture. The leather on my SBL BP is further toward the shinier end of the spectrum. • The hardware on this thing is not shiny at all. I strongly prefer the shiny nickel-plated brass on the SBL goods. • The pigskin liner is significantly different than the SBL material. Thinner and more flexible. The interior of my SBL bag feels like a smooth football. I hardly noticed that this bag had a distinct liner. 1. Lack of External Hardware. 2. Lack of Convenient Exterior Pockets. 3. Lack of Interior Pockets. 1. Hardware adds weight and utility. I like to do things like hang my sunglasses and my keys from the d-rings on my SBL backpack. This Marlondo piece has none such. It’s lighter for it, but if there is a use case for the d-rings and the trade off is worth it to you, take heed. I keep a microfiber cloth on the keyboard of my MacBook when the clamshell is closed to keep the screen clean. When I first sit down and open it up, I swipe the cloth from the keyboard and stuff it into one of the exterior pockets. I was thrown off when I went to do this with the Marlondo bag and discovered that it didn’t have any always-open exterior pockets. After this I started realizing how much I take those pockets for granted. Buyer beware. When I first got my SBL backpack those two interior pockets got in the way. They are a bit rigid, especially when they’re new, and if you already have half of the bag full, vertically, the interior pockets make it difficult to fill the space beneath them. This is a problem for me because I utilize all the space in the bag. That said, I started relying on them to carry my Magic Mouse, USB cable, external hard drive, etc. 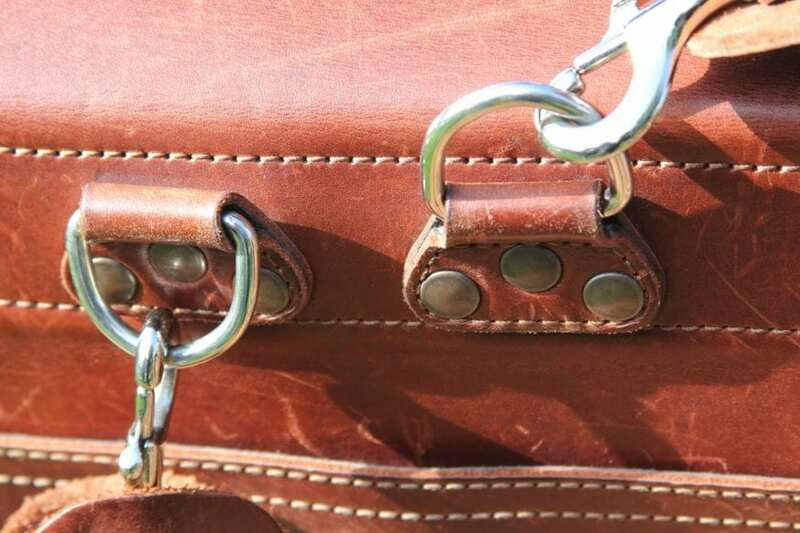 It’s nice to have them at the top of the bag, and it’s nice to have them in leather pockets that prevent them from banging around and scratching each other. The bag has become slightly more flexible with use and I’ve molded my packing workflow around them. The Marlondo bag has none such pockets, and it changes the way I have to pack the bag. I actually had to introduce smaller pouches just to carry these pieces, and I never got comfortable with it. Oh! I also used the flat pockets on the sides of the interior of the SBL backpack for business cards and writing utensils. I have no good place for that stuff in the Marlondo bag. The pigskin on the classic SBL backpack is fairly rigid and the general construction of the bag results in a fairly sturdy structure. One time I had an older MacBook in a Jansport and, upon entering my Toyota Corolla, I lost my grip on the bag and it slid down a couple of feet and met the road. It did $900 worth of damage. Flash forward a few years and I have my current machine in my SBL backpack on top of a stack of luggage in the back of a shuttle in Las Vegas. The driver opens the rear door and my backpack rolls off, drops about five feet, hits the road, and rolls another five or so. “Whoops,” he says, and smiles. I was furious, but I kept my cool. Anyway, the bag and it’s the thousands of dollars worth of contents, were all entirely unscathed. As if it never happened. I can tell that if I dropped the Marlondo bag on the street it would damage my laptop. I feel like I need a case for my computer while it’s inside the bag, which 1. eats into the available space, 2. adds weight, and 3. adds expense to the setup. It also gives me one more thing to handle when I need to retrieve my laptop and setup for work. But again, it’s a tradeoff. The flexibility of the bag may be an advantage for certain use cases. This strip of leather is slightly wider than the ring through which it must pass. This makes inserting it and extracting it more difficult than necessary. The short distance between the closure loop and the closure hardware makes it difficult to insert ones fingers in order to pull the closure piece out when opening the bag. This does not reflect usability testing. What other issues might this bag have due to lacking usability testing that I haven’t yet discovered? And, actually, the closure loop is surprisingly thin. Given than I carry very expensive cargo, which I use to earn my living, I can’t tolerate this kind of thing. For the generous capacity of this bag, its cover flap sure is skimpy. I live in the Pacific Northwest, where encountering rain and snow on the three-to-four block walk to my car from the café where I work is not uncommon. I need my goods to stay dry in my bag. This flap makes me nervous. Not impressed. It feels cheap, it’s inflexible, and it’s insecure. It bothers me that, given the large mouth of this beast, it is drawn together with this sorry excuse for a closure and immodestly covered to boot. The double-stitching on the SBL bags looks strikingly handsome. 20% of the people who come within 20’ of my SBL backpack approach me with compliments. The batting average of the Marlondo backpack fell somewhere between a Jansport and the SBL. 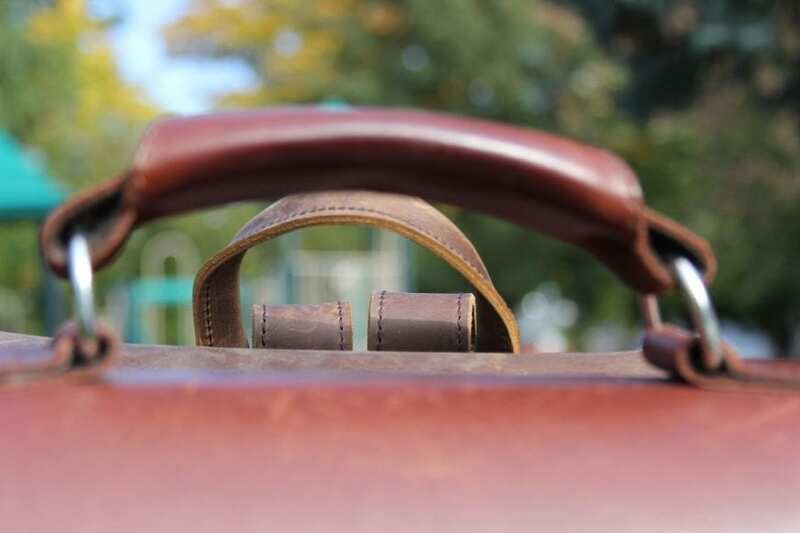 While we’re taking pictures however, note that the older SBL “overstuffed” straps use leather so thick that it can’t comfortably conform to one’s shoulder. In order to bend, it creates bumps that are fairly hard and uncomfortable. This is unfortunate. They may wear with time (20-100years?) and there may be workarounds, but still. Also, the seam that rubs along your lower back can be extremely uncomfortable after a while. Over-engineering comes at a cost. All of the touches SBL wanted to put on their straps added up. There is some added functionality/aesthetic value due to some of these little touches, but the end result is a lot of added thickness and weight and price. 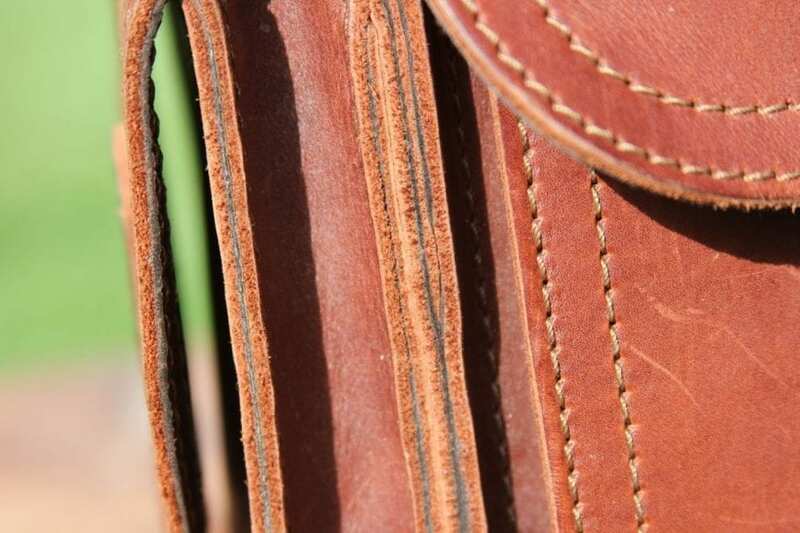 The Marlondo straps lack the detail, but aren’t plagued by the thickness and weight. They were fairly comfortable. Also, significantly cheaper. 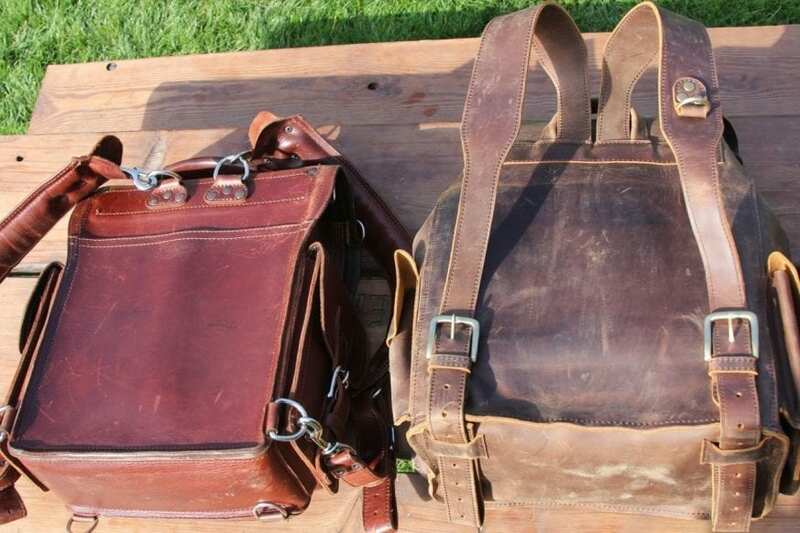 3 Comments on "Saddleback Leather “Tank” Backpack vs Marlondo Leather Backpack Review"